After the feedback and conversations regarding my last post Picture Picture on the Wall I realised that a follow-up post had to be written. I'm so enthralled that some of you have already been motivated to get things framed and up on the wall but realised that some practical tips and more ideas would be helpful. I've been really inspired by your ideas on the Facebook page and have lots more to share! First things first, before you get to hanging stuff up you still might need some help sourcing frames. Although it's cheaper to source a mixture of styles from charity shops and paint them yourself using chalk paint or even spray-paint, you might want to get certain things framed by a professional. If you're local to Lewisham I can highly recommend David Mitchell Framers. They are really helpful and have a ridiculous amount of ideas to choose from. If you're a bit further out towards Bromley/Kent, Inspirations in Orpington is another place that I've used in the past. When considering framing it's important to also consider what mount you are going to use. Framers can also put glass into blank frames and new mounts for a reasonably decent price. And by the way there are a HUGE range of colours for mounts so there is another opportunity to get creative! 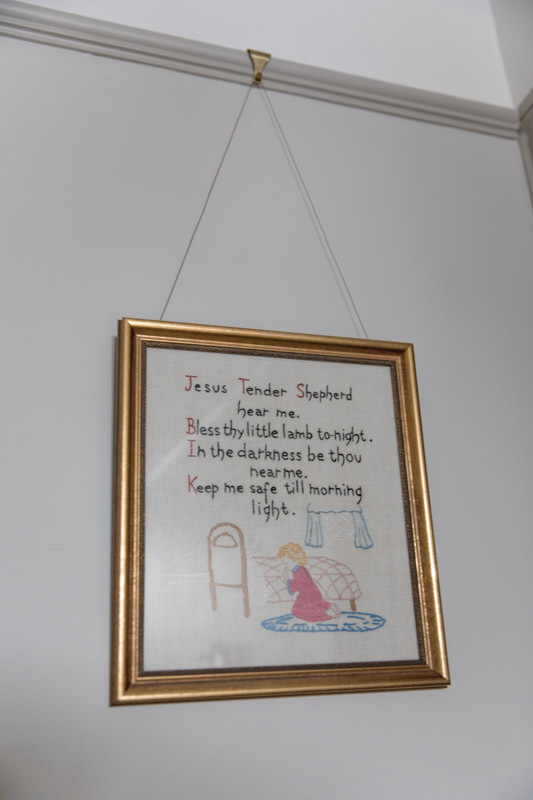 I love the idea of putting a small picture in a large frame with a huge mount. That's definitely my next project! This is by far my favourite picture hanging technique. The beauty of the picture rail is that you can constantly change around where frames are placed on the wall without leaving marks and if you're as indecisive as me this is great. They actually originate in the15th century but became popular in the19th century when it became fashionable to hang lots of pictures and trinkets in rooms. If you're redecorating and want to create a slight nod to period styling then consider installing them. They run horizontally in line with the top of the door frame and can be put in place with an adhesive and tacked in place with some nails before painting. In our home all the upstairs rooms bar Jack's room have picture rails. I have to admit that this genius idea was my husband's. Sometimes he's the one that pays more attention to detail in some of our DIY endeavours! When I finally got all my family photographs printed and frames painted for the gallery wall on the stairs I assumed that we would use string and nails but John spotted a flaw in this. The pictures would hang slightly forward which would spoil the illusion of all the carefully placed pictures. So my crazy genius husband decided to hammer a nail in the wall at the midpoint of where the frame would go and then using a fine drill-bit drill a hole into the frame, again at the midpoint. Now the frames sit completely flush against the wall! If you're planning a gallery wall my top tip is to use paper to trace the outline of all the frames you are going to use and position them as you desire on the wall so you can see that you are happy with the arrangement. There is a technique that you can use for larger frames that you want to sit flush against the wall and I discovered this technique when visiting Sophie's home to shoot images for my second 'Journey Home' blog post. She has so many pictures and artwork on the wall so we naturally got to talking about how to hang them. In her nine frame collage she drilled a baton into the wall the same width as the image and no deeper than the back section of the frame and I was really impressed that by even brushing pass the frame it didn't budge at all. Great technique! My final technique is something that I haven't actually tried yet but am very keen to in the near future. Command strips are great for renters as they won't leave marks in the wall but also they are also a lot less messy than drilling holes in plaster or bricks and don't take long to install. One of my favourite interiors blogger Sarah Akwisombe has just written a whole post about them if you want to read more here. So now you know how to do it you may need a little more inspiration of what to put up on those walls to make them look wonderful. Having enjoyed the process as well as the cost-effectiveness of sourcing cheap decorative frames and painting myself, I would love to do another gallery wall of holiday memories where I paint the frames the same colour as the wall. 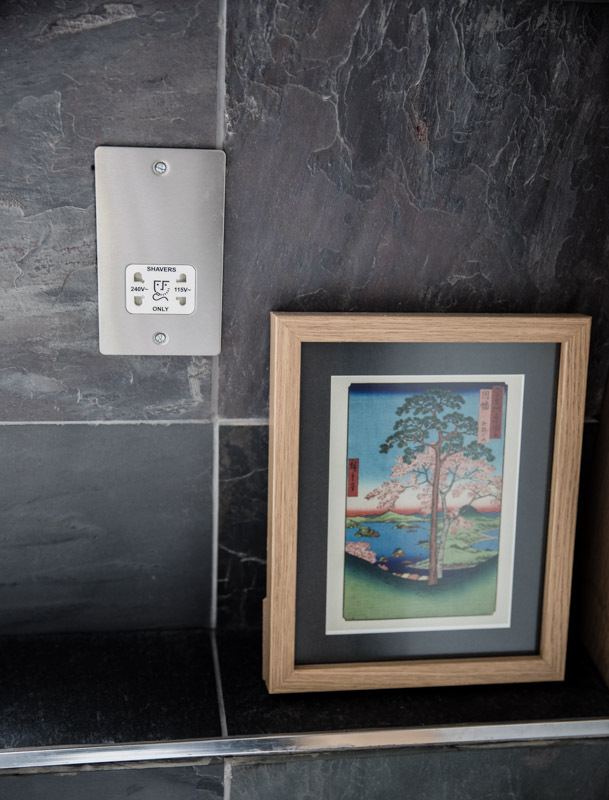 I'm hoping that as the frame blends into the wall it will help the images pop out but you will still see the texture and decorative edging of the frame. You can use the eggshell version of the wall paint or create your own chalk paint using normal emulsion which amazingly cheap and effective. If you want something different and to make a statement on your walls then here is something I discovered a few weekends ago when I was in a little cafe at Riverhill Himalayan Gardens near Sevenoaks (great day out by the way). 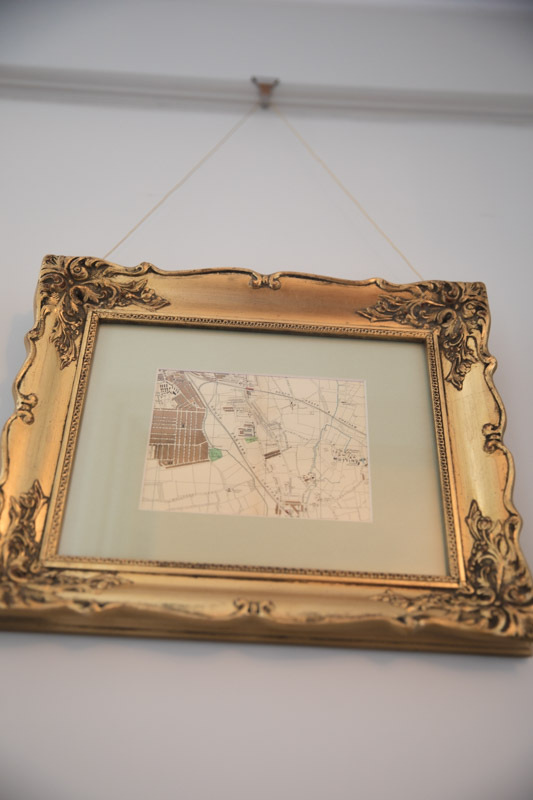 I just loved this idea of using a large ornate gold frame to outline the content of the wallpaper. For a while now I've been eyeing up different wallpapers and I'm hoping to find the perfect spot in our home to try doing a bit of wallpepring myself. I am still trying to decide where I could start a little project and am just dying to try out this idea. Apart from in the living room where these three photographs are placed in a line horizontally, I am generally reluctant about having symmetry or things too lined up in my rooms. I love the seemingly 'random' arrangement of gallery walls BUT I'm being really challenged by seeing some examples of great use of this in arranging artwork. If you remember my previous blog post you'll remember how that I was challenged to put up some photographs that my husband has taken and since have replaced some images he'd taken on our honeymoon into these frames. These photos have a special place in our hearts as they were taken when we were horseriding through the jungle in Cuba and stopped in this humble home to take shelter from a storm. The welcoming family made us coffee from beans that were rosated on the roof and brewed through a sock! A precious memeory of a beautiful encounter in a stunning part of the world. We all want some of that on our walls! I've had lots of conversations and seen lots of questions on parenting forums about what to do with and how to display our darling children's art. I have to admit that my preschooler is not a keen artist so I don't have hundreds of paintings. However I have kept a few that mean something or that really touched me. If there is something special your child has done consider having it framed and placed in a prominent position like in the photograph below. This was created by her son at age three (he is now an adult) and I love that it has pride of place in this home and displayed for all to see. Another way you can create a relaxed and layered look is using shelves to lean frames against the wall. If you have kids I recommend doing this high up on the wall for safety reasons. If you're a bit unsure what to put on your bathroom walls, my advice is just go for something that you love and that fits into your scheme. You might be surprised what can actually work in a bathroom. I hope that I've inspired you to try some new ideas in your home. Please get in touch with any thoughts you've had or how you've been inspired to add a bit of wow to your walls. I'd also love to answer any questions that you might have. I've still got a lot of ideas to try out but with two little ones I don't always have the time. In fact I have a box full of photographs and negatives (yes we are a bit old school here sometimes and love shooting on film) that need to be sorted through. That's definitely a job for a rainy day!